The task of competing with logistics giants Uber and Lyft seems more soul-crushing than ever. Uber’s valued at something like $70 billion. Lyft has those pink mustaches. How’s the everyman cab supposed to compete? Government support, of course. A recent ruling from the California Division of Measurement Standards will let a small startup called FlyWheel roll out a mobile-friendly operating system for taxis across the state. 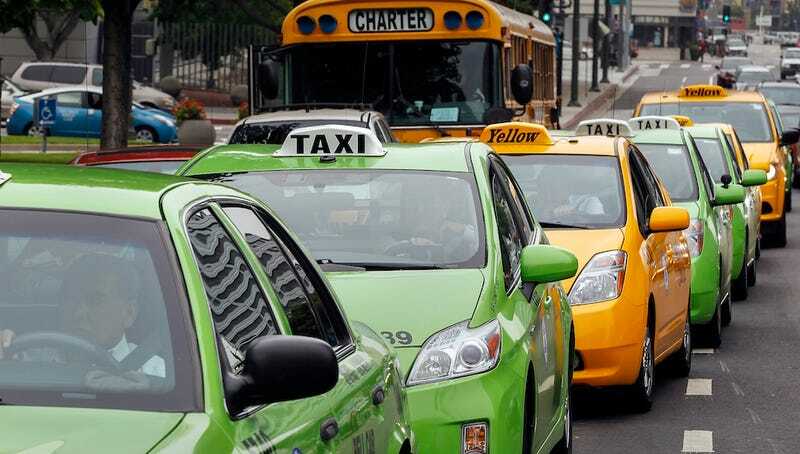 The so-called TaxiOS enables drivers to offer their riders Uber-like features such as GPS-metering, hailing taxis through the app, tracking available taxis nearby, and mobile-based payments. There is one key difference between Flywheel’s software and the Uber model, however. Working with local authorities to create an Uber-killer is a neat idea, but it’s not a new one. A taxi industry-approved app called Arro launched in New York City a few months ago. Arro only worked with about half of the city’s cabs initially due to contracts with existing payment systems. It’s also obvious from using Arro that its development team will have a hard time competing with the slick Uber app. Nevertheless, both Arro and TaxiOS can probably enjoy operating in their respective regions without angry cabbies coming after their drivers with sticks of fire. Then again, it’s hard to win a race when you start four years too late.